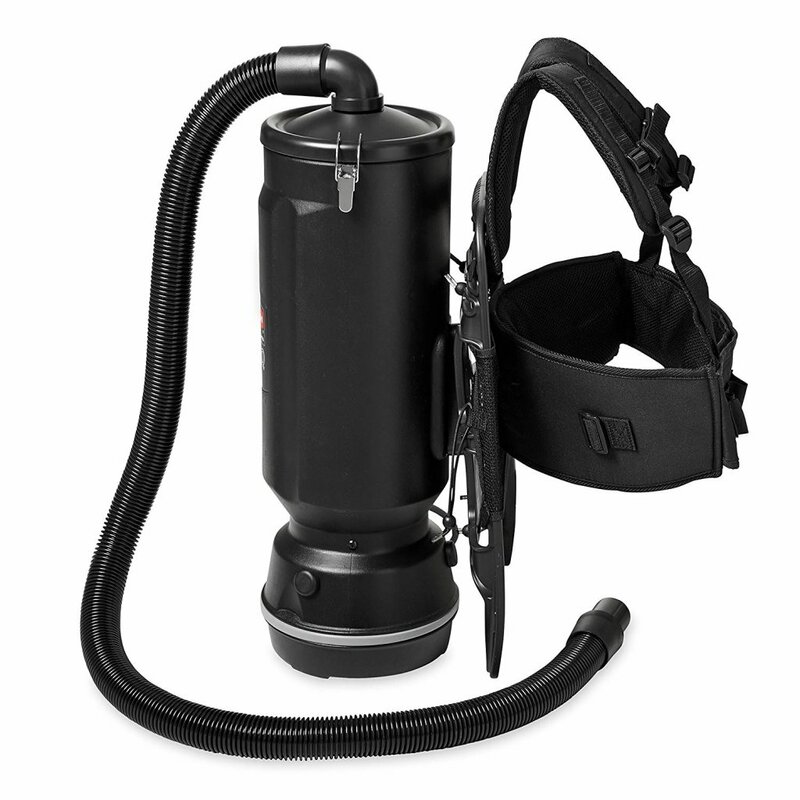 Other than canister and upright vacuums, you can get a backpack vacuum. 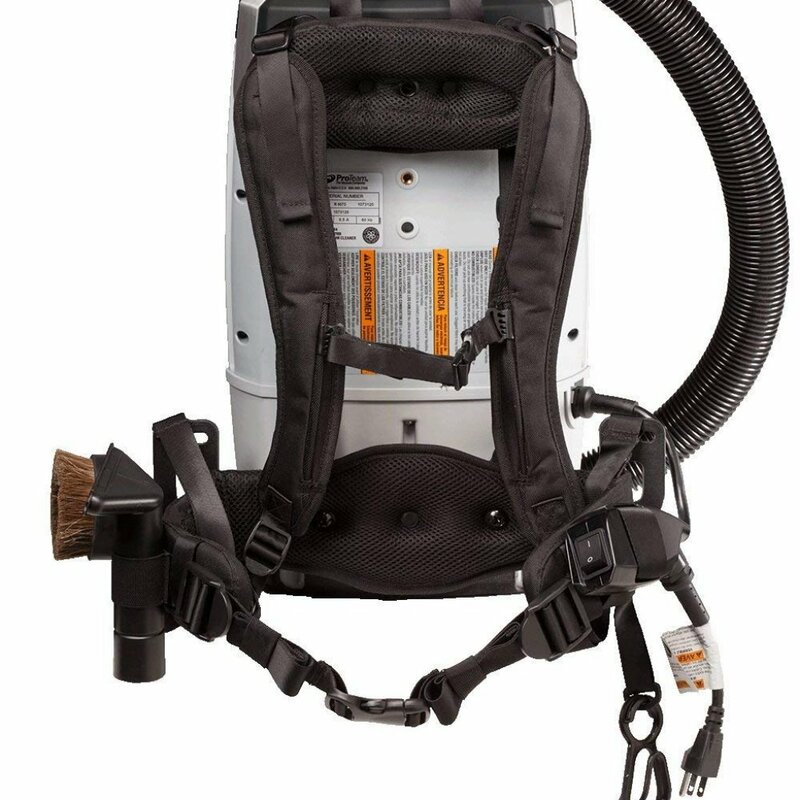 In any case, it is quite easy guessing what a backpack vacuum is, and as the name implies, it is a device you carry on your back. If you are wondering what the use of such an invention is, well it’s because they increase mobility, comfort, and efficiency when working. According to ISAA, a cleaning industry association, a backpack vacuum is faster, and a pro-team can clean a 2,500 square foot area in less than 20 minutes while it would take 46 minutes when using canister or upright vacuums. Moreover, they are best for use in the commercial setting owing to the speed as time is money in the business world. Topping our list is the Hoover C4201. The apparatus gets some great reviews from owners for being a workhorse and for its efficient design that reduces the cleaning time. Moreover, it is quite comfortable to wear but more on this shortly. The HEPA filter on the C4201 cleaner makes it ideal for households with asthmatic people while the 6.4-quart capacity ensures that you don’t have to empty the bag regularly. The bag is reusable, but some owners prefer replacing it with disposable bags as it is delicate and requires cleaning. Another fascinating feature of the Hoover C4201 is the power cord. With a 50 ft. power cord, you will have uninterrupted cleaning, and you can cover large areas without re-plugging. The hose is 60” long and has a 360® swivel capability which increases the versatility. Our best features though were the lightweight backpack design and support harness. Support harness – First, the harness was made by a chiropractor, and thus you are confident that using the C4201 for a considerable period will not result in back pain. Lightweight backpack design – The Hoover C4201 weighs 9.2 pounds which is light compared to an upright unit which weighs about 20 pounds. Moreover, you will feel one with the vacuum, and you don’t have to concern yourself with pulling a device behind you as you clean. Thanks to the HEPA filter, the C4201 is great for households with asthmatic people. You can also get it for cleaning floors, ceilings, upholstery, and corners as the performance is surreal. Finally, it is excellent for quiet neighborhoods thanks to its smooth operation. As a result of the backpack design, there is no frustration from having to drag a vacuum on wheels. 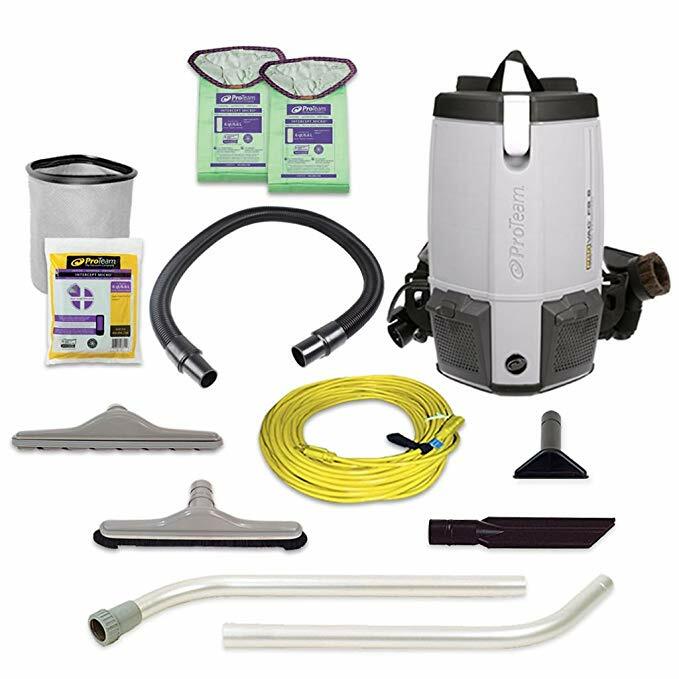 Following on our list of the best backpack vacuums is the ProTeam Super QuarterVAC. This unit is the smaller sibling of the Super Coach but equally robust. First, you will appreciate that this unit is 43% more efficient at picking up dust and dirt and works in less time than other appliances. Moreover, it is designed to be more versatile thanks to the 50-foot power cord that allows you to clean large areas without re-plugging. Another fascinating feature is that it is ergonomically designed and thus you can use it for long hours. The unit weighs 10 pounds and uses your body’s core and leg muscles reducing strain. Moreover, you will appreciate how tightly it fits your body reducing any accidental contact with household items. The tool belt also happens to be a nice touch as it keeps the accessories at hand. Finally, the unit is quiet and thus ideal for quiet neighborhoods. As for our top features, we loved the filter and the versatility. Versatility – Unlike our top pick, the Super QuarterVAC is superb on low profile carpets. Its performance on hard surfaces such as hardwood and tiles is surreal too. Finally, the above floor performance is unrivaled. Filter – With a 4 level filtration process, it captures 99.97% of allergens improving indoor air quality. The ProTeamis magnificent for use in hotels, motels, conference halls or any other area where silence is compulsory. This ruby red vacuum cleaner does more than look good. It is quite powerful thanks to the 84-inch water lift rating. 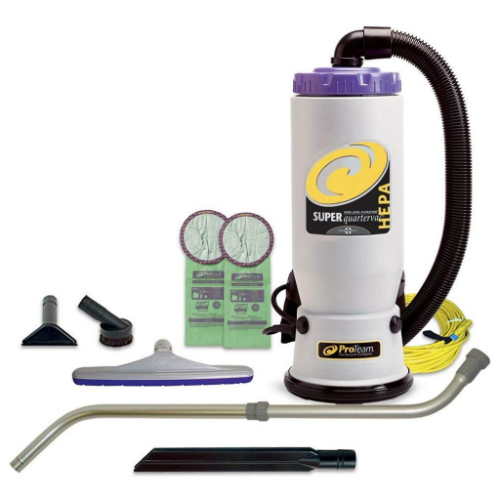 This suction power makes it easy to clean any surface. First, this unit is designed to be durable and long lasting and incorporates a 2-year manufacturer’s warranty. The 4-stage filtration process though protects the 12 amp motor from any dust and debris. The method also gets rid of any most allergens making this unit ideal for use in households with asthmatic and allergic people. Our best features of the GV 8-Quart were the versatility and ergonomics. Ergonomics – The GV 8-Quart is built with comfort in mind. First, the unit has 2-inch padded straps to keep them from digging into your skin. The waist straps are padded too, and there are finger grips on the handle to prevent hand fatigue. You will also appreciate that the metal wand adjusts to the user’s height to avoid back pains. Finally, you can switch the hose’s position to suit your dominant hand. Versatility – The GV 8-quart has 7 attachments increasing the resourcefulness. The brush roll nozzle is superb for carpets while the deluxe floor tool is exceptional for going from hard floors to area rugs with the switch of a button. There is also a crevice tool for cleaning tight spots, and an upholstery tool. However, you can use the unit as a blower thanks to the airflow adapter. This is great especially when you have to get debris from tight spaces. Great for in-home use thanks to the quiet operation. It is also perfect for RVs, cars, and boats. If you are in the market for an affordable option, we recommend you get the VACBP1 by Atrix. The apparatus happens to be less than half the price of other units on this list. Thus, it is best for most homeowners or individuals on a budget. The Atrix-VACBP1 also happens to be a mighty unit at 106CFM, and most owners claim that it sticks to the floor. The versatility is another reason you should get this unit but more on this later. The four-stage filtration protects the 12 amp motor while filtering out 99% of the allergens. Ergonomics – At 10.3 pounds, the VACBP1 is a lightweight unit, and thus you can use it for long hours without fatigue. Moreover, it is a compact unit at 12” by 9” by 20,” and therefore there is a lower likelihood of knocking down household items. Furthermore, it easily converts from left to right hand depending on your dominant arm. Versatility – The Atrix VACBP1 is designed to handle any task imaginable and has the accessories to do just that. A 6’ hose, a blower adapter, a 22” to 38” extension wand, 3 blower nozzles, a round brush, a crevice tool, an air driven turbo brush, a furniture nozzle, etc. We recommend the Atrix VACBP1 for people on a budget. If you are looking for a unit to handle tough messes, we recommend you get the ProTeam ProVac FS 6. It is loaded with accessories that make cleaning floors, carpets, around tables and chairs, and above floor-cleaning a breeze. It also happens to be a quiet unit at 65.8 decibels. Therefore, you can use it in hotels, motels or other areas where silent operation is required. Other than the silent operation, you will love the comfort when using this apparatus. The FS 6 is designed to be cozy, and the FlexFit harness and shoulder pads are thicker for that purpose. You can expect to use the FS 6 for more extended periods without fatigue. Moreover, the FlexFit harness is designed with better lumbar support and a stronger sternum strap. The unit is also designed to fit closely to your body thereby reducing any accidental contact with walls and household items. For mobility, the FS-6 features a 50-foot power cord allowing you to clean large spaces without having to re-plug it. You will also love the 4 stage filtration level as it not only keeps the motor safe, but it also removes 99.97% of particulates and 0.3 microns of allergens and food debris. Nevertheless, our best features were the power and open weave harness. 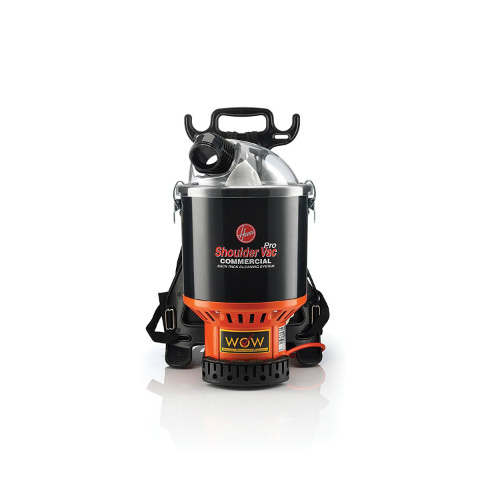 Suction power – Seeing as it is designed for tough messes, the ProVac FS-6 has a 159CFM to back up the claim. Open weave harness – The open-weave keeps you cool by dissipating heat enabling you to work longer. Other fascinating featuresare the accessories. 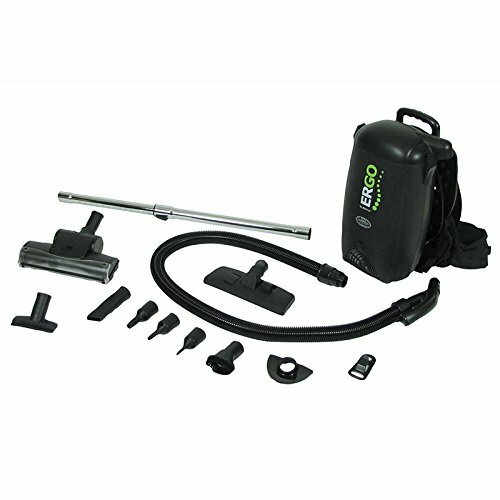 The unit has a crevice tool for getting into tight spots, a carpet floor tool which is only good for cleaning low pile carpets, a hard floor tool for picking dirt from hard surfaces and a two-piece wand for extended reach. The ProTeam ProVac FS-6 is designed to triumph over needs of the foodservice industry. 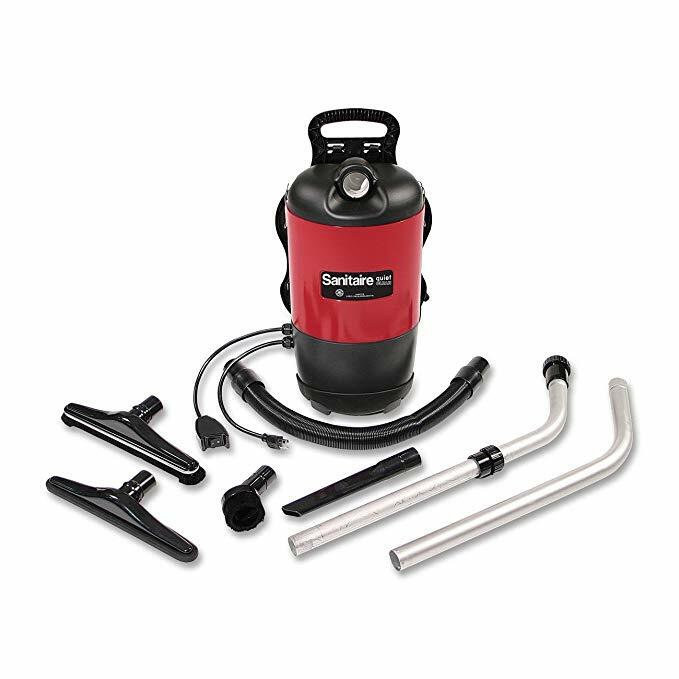 According to Sanitaire cleaning performance should be seen, not heard, and they have designed the EURSC412B for just that. At 69db it is quiet and an ideal choice for places that require a quiet operation. It is also a powerful unit at 1380 air watts and 120CFM which is enough to clean tough messes. The HEPA and synthetic media filter, on the other hand, will filter 99.97% of allergen and thus great for asthmatic and allergic people. 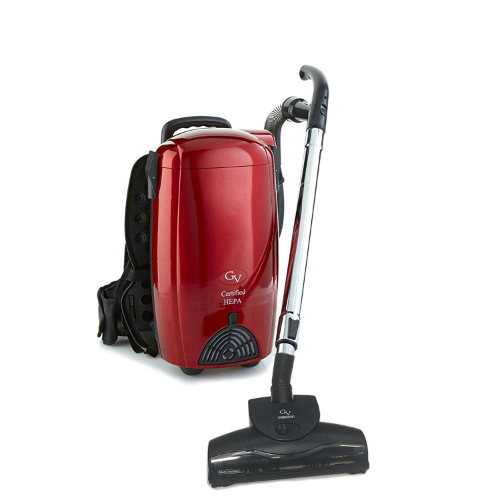 To enhance mobility, this vacuum cleaner features a 50-foot detachable cord. You will also appreciate that it meets LEED requirements and it is UL-listed. Our best features though were the cleaning path and accessories. Cleaning path – The Sanitaire as a 12” cleaning path meaning you will clean a larger area in fewer passes. This is especially handy in commercial settings where time is money. Accessories – For above floor cleaning, the EURSC412B features a dusting brush but also has a crevice tool for getting into any tight spots. Also, there is a carpet tool for cleaning low pile carpet and an exceptional bare floor tool. The dirt capacity is 6-quarts and thus doesn’t require you to empty often. The EURSC412B is designed for those hard to get to spots. Furthermore, we recommend it for people who want faster cleaning time owing to the larger cleaning path. If you are looking for CRI approved backpack cleaner, we recommend you get the Rubbermaid Commercial Executive series. There are three models available, so the price depends on the unit you pick, but they are reasonably priced. However, the only difference is the capacity as you can get a cleaner with 6-quart capacity and one with 10-quart capacity. Some exciting features of this unit include the 110 CFM and the 100” water lift efficiency, and thus it is perfect for both hard surfaces and carpets. You will also appreciate the HEPA bags and the resealing tech on the unit as you don’t have to reseal debris when changing bags. Moreover, the harness is adjustable for a perfect fit. Therefore, the vacuum cleaner can work with anyone. Also, the controls are easily accessible for better control over the unit. Finally, it is the best for quiet operation as it has noise levels of 66DB. Durability – One of our top features on this unit is that it is built to last. Having realized that cord damage is one of the most common on vacuums, rubber maid incorporated a hard mounted cord restraint that lessens the strain on the line. Accessories – The Rubbermaid unit is designed to handle multiple cleaning tasks. The aluminum wand is light, and long enabling you to reach farther places without having to bend over. You will also appreciate the dusting brush for cleaning delicate surfaces, the upholstery tool which is superb for cleaning sofas and pet hair. The crevice tool enables you to get into any tight spots while the sealed bags are easy to attach and remove from the bag. This unit is best for use in industrial settings, but you can get it if you are looking for a quiet apparatus. 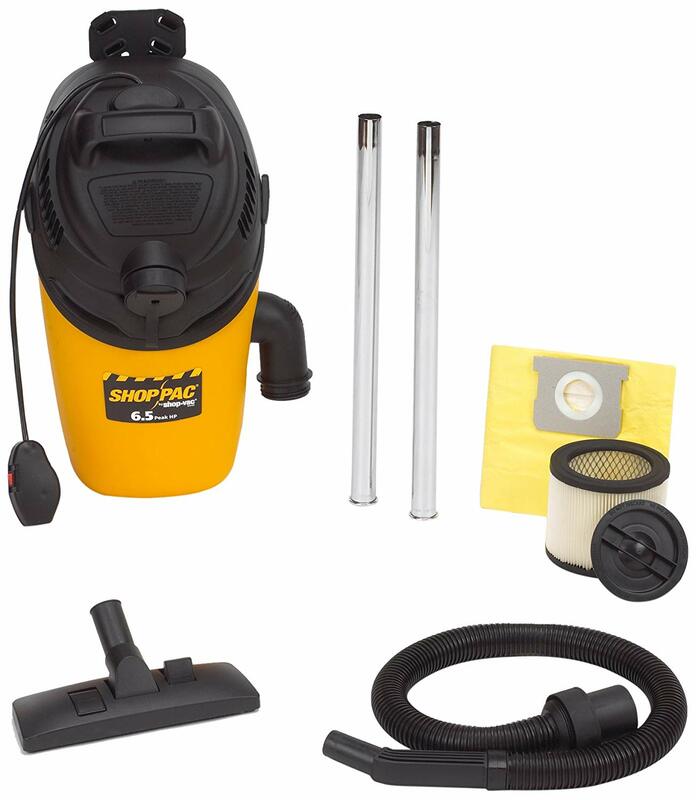 The Shop-Vac vacuum can be used anywhere in your yard, in your garage, or in your home. It happens to be an affordable unit and thus great for residential uses, but there is nothing low cost about this unit. First, it is the lightest unit on this list weighing 8-pounds. Therefore you can use it for extended working hours without fatigue. It also features a substantial power cord which measures 25 ft. This is enough to clean a room without having to re-plug it. Moreover, the on/off switch is easily accessible increasing the control you have over the unit. Some other fascinating features of the 28600010 are the accessories. The unit has a 4-foot 1-1/4” lock-on hose, and metal extension wands with a positive lock on. There is also a dual surface nozzle, and a cartridge filter. However, our best features are the power and carrying handle. Suction power – At 210 CFM, the Shop-Vac happens to be the most robust unit on this list. It is enough to pick up the toughest messes. However, what’s enthralling is that it is available at this price point. Carrying handle – If you don’t want to use this unit as a backpack, you will appreciate the top carrying handle as you can use the vacuum cleaner as a briefcase. The Shop-Vac 2860010 is best for homeowners on a budget, and should only be used for dry-cleaning. If you are in the market for an extremely comfortable unit, we recommend the BP6P if you don’t mind the high price point. The unit is designed to be cozy and has all the features to back it up. The cleaning performance is also incomparable with a 130 CFM and 110” water lift efficiency. Cleaning hard surfaces and carpets should now be a breeze. Another fascinating feature of the Powr-Flite BP6P is the noise level at only 62DB. If you are looking for a unit to use in hotels or quiet neighborhoods, we recommend you get this unit. Moreover, the BP6P has accessories that allow it to handle most tasks. First, there is the 17” crevice tool to clean any edges or tight spots. The 3” dusting brush is great for cleaning delicate surfaces while the 5” upholstery tool is good for pet hair and cleaning drapes and furniture. However, our best accessory was the telescoping wand. It can stretch from 32” to 60”. Therefore you can get the perfect length to suit your height. The hose too can stretch from 2’ to 6’. Our best features though were the harness and filtration. Filtration – The BP6P is the only unit with a 5 stage filtration process. It incorporates a HEPA filter bag, an SMS shake-out bag, pre and post motor filters, and finally an exhaust filter. Harness – The Powr-Flite uses Deuters harness. Expect 25% reduced perspiration and better adjustment thanks to the Variquick system. 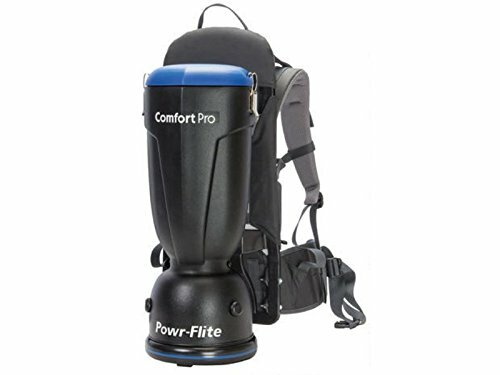 We recommend the Powr-Flite BP6P for people looking for better comfort. If you are looking for a lightweight unit, we recommend you get the Oreck XLPRO64. Weighing a mere 10 pounds, it is one of the lightest options in the market. You can expect to work long hours without fatigue. The unit has a 6-quart capacity meaning you can clean large spaces without needing to empty it. You will also appreciate the 4 stage filtration process as it keeps the motor safe from dust and can get rid of 99.97% of particulates. Our best features though were the ergonomics and the extension cord. Ergonomics – The Oreck is designed to be comfortable enabling you to clean large areas with little fatigue. First, it weighs only 10 pounds but also has surreal shoulder straps with added stability of a waist belt. Moreover, the waist belt does more than offer support in that it is designed to hold tools so that they are within reach. You will also appreciate the 50-foot long cord as it gives you better mobility. There is also the aluminum wand that is lightweight and is attached to the backpack with a stretch molded hose bettering the maneuverability around furniture and other house obstacles. Extension – Other than the 50’ foot power cord, this is the only unit that includes a 50’ extension cord giving you unmatched mobility. The Oreck is best for people in the surface industry or airports or areas with large open spaces that need the extension cord. Has a 2 yr commercial warranty. 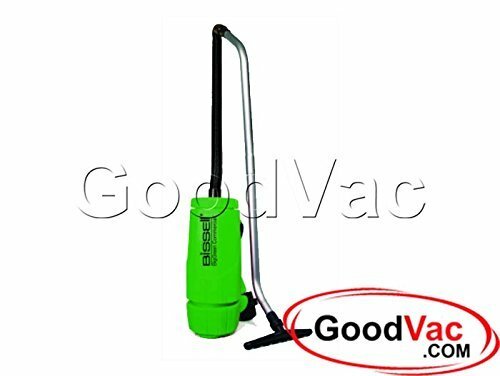 ✓ Backpack vacuums are light and easy to maneuver, unlike uprights or canister which are often bulky. ✓ They also have a higher reach for better above floor cleaning, and they can quickly get into tight spaces and clean around obstacles. ✓ You suffer less strain and stress on your muscles when using one unlike a canister as you can work standing upright with the weight equally distributed. ✓ As they are designed for commercial use, they tend to be more durable. Couple this with the fact that they have fewer moving parts and the likelihood of them incurring any damage is almost zero. ✓ Finally, they have massive storage and better filters, and thus you don’t have to empty the gadget that often. Backpack vacuums have their shortcomings as well. First, they have fewer features than those you would find on an upright or canister, and on average they cost more than most vacuums. However, the pros outweigh the cons, and we recommend you get one. Looking for a backpack cleaner though isn’t an easy task. There are some recommendations but first here are some tips to help you make an informed decision. Remember that this is a unit that you will carry on your back. 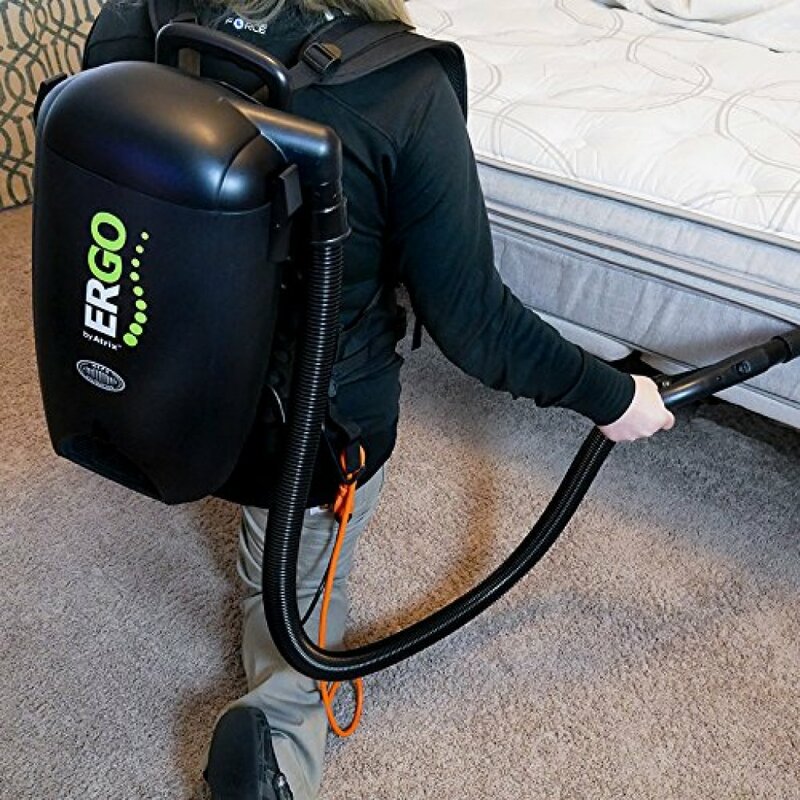 We recommend you purchase a light vacuum and your back will thank you later. When you are purchasing one, the idea is to clean thoroughly and in the shortest time possible. You want a unit with higher suction power to clean any surface. Pay attention to the cubic feet per minute (CFM), and pick a gadget with a high CFM but within your budget. Another vital detail to pay attention to is the harness construction and quality. You are not only looking for longevity but comfort too. Look for a unit with padded harnesses that are well designed to balance it on your back. The harness belt also should fit perfectly around the waist. Finally, ensure that the power cord of the unit is long, so there are fewer re-plugs. Seeing as the idea behind these devices is speed, a shorter cable will negate this since it requires more re-plugs. Moreover, it limits your flexibility. You can also purchase a backpack unit with extra tools to increase your versatility. Finally, get a unit with efficient filters as it will keep you from having to empty it that often. We recommend HEPA filter as they will also keep the air clean. Before purchasing a backpack unit, ensure you genuinely need it. Remember that these units cost a small fortune and it is unwise expending that much money on a gadget that you will use occasionally. What are some of the features available on the more expensive models? Well, you can expect to get more perks and benefits when you purchase a pricey model. First, expensive units tend to be more comfortable. The harness used are durable, padded and ventilated for comfort. They are also quite adjustable allowing you to get a customized fit. However, you will also appreciate the freedom that comes with cordless cleaners. 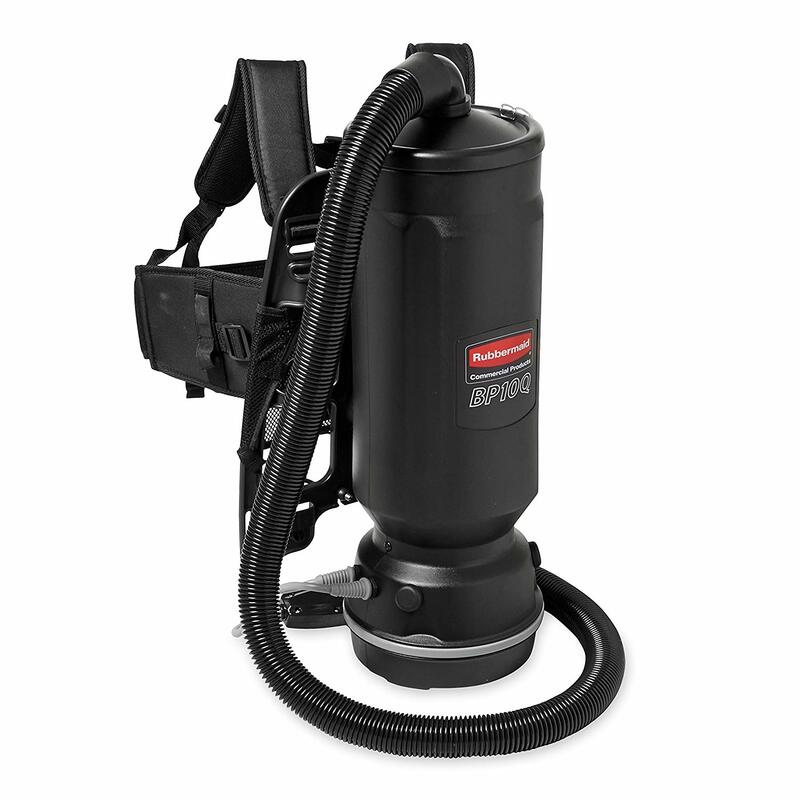 However, the price bump to get a battery-powered backpack vacuum cleaner is lofty, but the range of motion and better mobility is worth it. Moreover, you get a better warranty coverage when you pay more. It increases from the standard 1-year limited warranty to a full 3-year coverage. Finally, expect better quality components, attachments, and support. How do I store my backpack vac? Storing these cleaners is daunting for most owners. You have to worry about the extension cords, the power cords, the tools, the canisters, etc., and all this can create a jumbled mess that is tedious to sort. You can purchase a storage bag, but some manufacturers leave it to your creativity. We recommend you get some heavy-duty hooks to hang the canister and the cords. You can use totes too or the corner of a closet. Why do I want a dirt-sucking machine on my back? The idea of having a vacuum cleaner on yours or anybody’s back is appalling. However, the experience is just surreal, and most users dread going back to using upright and canister vacuums. The push and pull experience cannot compare to the experience of using a backpack unit. When using a backpack cleaner, you become one with the unit, and there is no limit to what you can do or where you can clean. Getting into tight spots will be more comfortable with the crevice tool, above-floor cleaning is effortless, and some units turn into blowers. The combination of portability, maneuverability, and versatility outdo any upright unit. What can’t backpack vacuum cleaners do? These devices can clean most surfaces, but there is one place where they fall short. Most backpack cleaners don’t perform on high pile carpet. They lack the brush roll to agitate the dirt. Be sure to remove and clean filters occasionally or replace them when necessary. Also, you should clean the brushes and attachments of hair and debris that is bound to collect. Finally, these units feature high-quality filtration processes and thus be sure to conduct regular inspections. Are there backpack vacuums for home use? Finally, the most common question is if they are available for home use. The short answer is yes although most units are for commercial purposes. They have excellent results and have fewer hassles than an upright unit. Keeping a fresh, clean home is paramount for peace of mind. Regular vacuums ease that task, but most are inefficient, or can’t handle all cleaning tasks. Yes, an upright unit is powerful, but it takes too long to clean, it is bulky, and cannot get into tight spots. A backpack cleaner, on the other hand, is equally if not more powerful, gets into tight spots, and cleans in less than half the time. This guide helps you make an informed decision before you make a purchase. Thanks for coming this far, and please leave a comment below if you feel there is something we missed.